Looking to make a difference in our world? It’s time to use all of your education and experiences to be an instrument of change. 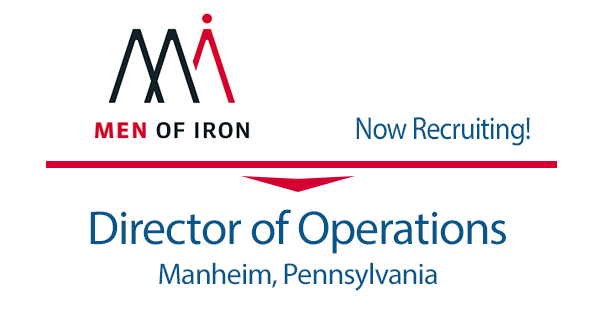 In HIS Name HR is honored to have been retained by Men of Iron to seek their next Director of Operations. The leadership of Men of Iron believes men are distinctly called to be Godly leaders in their families, their churches and their communities. Men of Iron equips men and grows Godly leaders through creating and sustaining 1-to-1 and micro group mentorships. They partner with leaders, influencers, churches and communities to implement and execute a culture-changing men’s ministry. Step up to the plate and be part of changing a culture, one man, one family, one church and one community at a time. The Director of Operations is a core function of Men of Iron, responsible for leading, growing, scaling and organizing the ministry by overseeing its programs and services (Strong27™). He creates and provides strategic guidance to grow a regional model and is expected to develop and execute creative strategies, operations and systems to grow and scale men’s mentorships around the world. He is the leader of ministry staff and representatives through his leadership, management and accountability characteristics. He is the 2nd most senior manager of Men of Iron’s operational hierarchy and holds the position of Integrator. Successfully leading, growing and scaling a business or business operations. Must be computer literate. Working knowledge of Apple operating systems and Microsoft 365. Able to navigate and become familiar with CRM software. Must be able to produce a statement of Faith. Complete support of and willing adherence to Men of Iron’s mission, vision and core values, applicant must hold these standards as his own. Cover letters should include why you should be considered for the position and what would make you the best candidate. With operations in Melbourne Australia, The Ambitious Entrepreneur Podcast Network hosts weekly podcasts, broadcasting inspiring and informative interviews to an expansive growing audience worldwide. 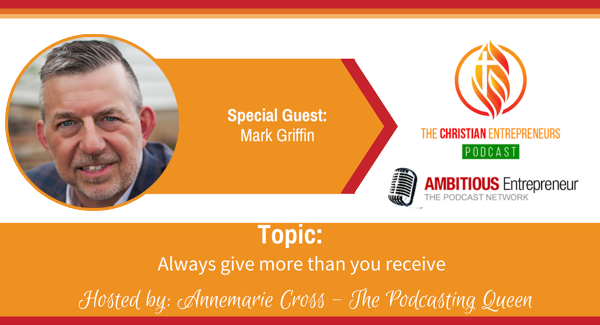 Enjoy listening to Guest Mark A. Griffin discuss “Don’t ask what God can do for you; ask God what he wants you to do for him!” with host Annemarie Cross. 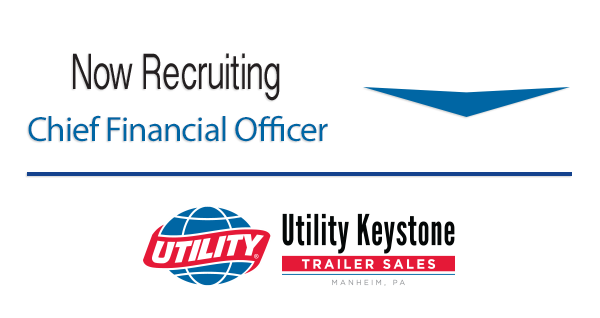 We are excited to be retained by this wonderful organization, Utility Keystone to assist in recruiting a Chief Financial Officer for their Manheim PA location. With over 30 years in the industry Utility Keystone continues to build its legacy of providing the ultimate customer experience. The CFO is accountable for the financial operations of the Company, including the development of operational and financial metrics to assess alignment to the Company’s plan. Through their leadership, they set policies and procedures designed to protect the Company’s assets from theft or misuse by establishing and maintaining effective internal controls and processes and report accurate financial results. As a member of the Leadership Team, the CFO works closely with the President and Department Heads to provide accounting supervision for all locations, as well as provide essential support to the Sales, Service, Parts, Inventory and Lease and Rental. Provide financial analysis tools to evaluate company ventures, special projects, capital expenditures, etc. Bachelor’s degree in Accounting plus 10 years’ experience in senior financial management position; or equivalent combination of education and experience. CPA designation and/or MBA preferred. Proficient in Microsoft products.Strong knowledge and experience in using service operating systems a plus. Use of all current technology as a communication and efficiency tool is a must. Complete support of and willing adherence to Utility Keystone’s mission, vision and core values.Applicant must hold these standards as his/her own. 2019 Trends and Analysis ~ How To fix Healthcare in America? Healthcare Is Broken. Costs continue to rise. But have you ever taken time to understand why? The deck is stacked against Employers and Employees. Come learn more about identifying the problems, and steps you can take to stack the deck in your favor. Patrick T. Moran II, CLU – President and founder of INGROUP Associates, (now an Alera Group company) and has been in the insurance business since 1985. Pat specializes with working with business owners in the areas of Employee Benefits, Estate Planning, and Business succession planning. Pat is also one of the founding members of the Alera Group, which is a nationally recognized Employee Benefit consulting firm. Alera Group is a collection of Industry thought leaders, providing National Scope of services, combined with Local Service. Today, Alera is one of the fastest growing Employee Benefit consulting companies in the country. Pat is a graduate of Bloomsburg University, and received his CLU from the American College. He also serves on several boards, and enjoys family time, Tennis, and Biking. You can’t open a news website without seeing another #MeToo circumstance being reported. As a result, many organizations have a “zero tolerance” policy for sexual harassment in the workplace, but what does that really mean to you, as a leader? Or you, as an employee? What is sexual harassment? Sexual harassment is unacceptable in any workplace. It simply should never be tolerated. 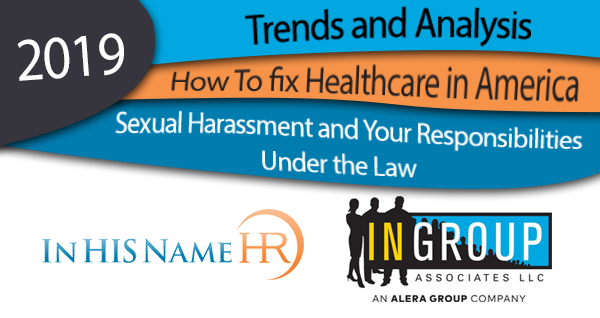 Come learn how you can help free your workplace of harassment and make it one where all employees will grow and prosper. Mark is not an attorney. This presentation is to provide practical and HR related experiences and should not be considered legal advice. “Job descriptions (JDs) are just so 1980s,” a young HR graduate recently commented to me, He could not be more wrong. Having worked in HR for over 25 years, I can tell you that some things just don’t change—and shouldn’t change. New technology consistently bombards us; faster, better, and sleeker processes seem to overwhelm us. One thing that will never change is the fact that, in order to be a High Performance Organization, you still need to get some “old school” work done. Don’t let technology and “the new workplace” fool you. Now, more than ever, you need JDs. Recruitment – As you grow and expand, it is almost impossible to hire legally or correctly when lacking a solid, well-written job description. Teambuilding – It is difficult for Teams to form and support each other when job duties are gray and tasks constantly conflict or interrupt each other. It is enlightening to know what each Team Member is responsible to accomplish. 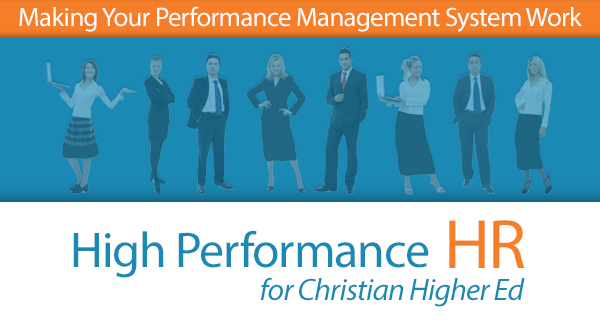 Performance management – This enables you to set measurable performance goals based on duties listed in the corresponding job description. Having them listed, in writing, signifies their importance. Training and employee development – You can use job descriptions, along with descriptions of possible job promotions, as a tool to determine what to pursue in regards to classes, seminars, and other career development activities in order to close gaps. Compensation- JDs can be helpful in developing a standardized compensation program with minimums, maximums, and target pay for each position. They help highlight internal equity issues to decision makers and contribute to fairness. Recognition and rewards – You can use job descriptions as a baseline for performance, and as a tool to encourage performance “above and beyond” the job description, in order to distribute recognition and rewards or just plain old praise! Discipline – Sometimes employees just don’t do what needs to be done. Hopefully, this does not happen at your place of work, but sometimes Team Members fail each other. If you need to, you can use job descriptions to illustrate when employees are not performing up to agreed-upon standards. Essential job function analysis – The physical and environmental setting is important in order to provide employees, including new hires, who need accommodation. Not only is this the right thing to do, but it is also the law. As of July 1992, the Americans with Disabilities Act (ADA) mandates that an organization assist an employee when a request is made for a reasonable accommodation under the ADA. Don’t make JDs more work then they have to be. Instead, make it a process to enjoy and learn from—it does not have to be awful. Be joyful and helpful with the process, and your staff will love you for it! During the past several years many organizations enjoyed what felt like a relatively low turnover rate. Many leaders thought that the reason turnover had decreased was because of the downturn in the economy. That’s not entirely accurate. Long term employees were holding on, but new hires still turned over at an astonishing rate. As the 2014 Equifax research shows, on average, more than half of all employees who left their job in the past year did so within the first twelve months. Concerned? You should be. The average cost to recruit a single new employee is well over $4,000 and will take on average 42 days to fill the vacancy (SHRM study 2016). This figure does not reflect the time spent or the decrease in morale as the search drags on. Since the rate of turnover is potentially the highest during the first year, let’s take a closer look at one way we can stop the hemorrhage. There is a misperception shared by many of today’s leaders that orientation and on-boarding are essentially one and the same. They are not. Simply stated, orientation comprises the tactical tasks to complete in order to get an employee ready to get to work, for example, computer login registration, physical building access, facility tours, and a basic HR overview of policies such as benefits and the employee handbook. So, how is on-boarding different? On-boarding is assimilating your new employee to the culture of your organization. It is about introducing your new employee to your organization’s values, its norms, providing a recipe that lists the ingredients of what makes up your organization’s culture, and how they can blend effectively with them to create a desirable end product, leading to the greater success of your organization as a whole. An effective program helps the new employee align themselves to your Mission, Vision and Values. This is a very important step to organizational success. 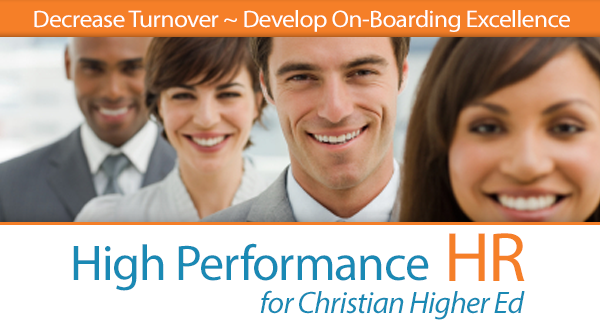 Want to create an effective on-boarding program? Consider these 4 steps. Create a focus group that consists of the most recent six people you hired. These are the individuals who best know what does and doesn’t work— they’ve just lived through it! Task the focus group facilitator with developing a list of items that should be included in the on-boarding program. And, once your HR leader develops the final program, schedule the focus group to meet again to ensure the legitimacy of the program. Ensure job description review, refinement, and updating are all a part of your process. Have every new employee consult with co-workers and corresponding leaders to update their job description so that they have full ownership. Have them present to their leader the key areas of development for promote-ability based on future career assignments. Get them thinking about their own development now, not after they tire of their position. Arrange for new employees to meet with a different manager in separate departments several times over the course of some months. Earlier in my career, we built a process at the Quaker Oats Company where all new employees or transferees would go to lunch with different department managers and several members of their department. It is a fantastic way for new employees to feel part of the Mission of the organization. Create a checklist for employees to follow and update going forward. Have them meet with their manager twice a month to discuss how the process is working. Ensure participation is built into their 90-day review. Holding them accountable will ensure they take an active role in the process. One thing is for sure—most organizations have veered away from progressive HR programs in the last several years, losing time and money, as well as valuable employees. Isn’t it time you started focusing on the fundamentals and take the time to bring your people on board correctly? After all, people are your most valuable resource. 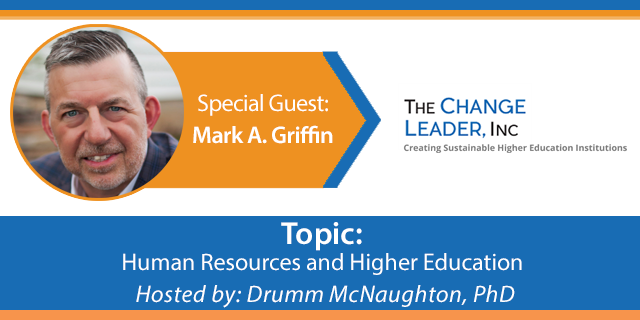 It’s one of the best investments you can make in the long-term success of your organization. What on-boarding programs have you had success with? 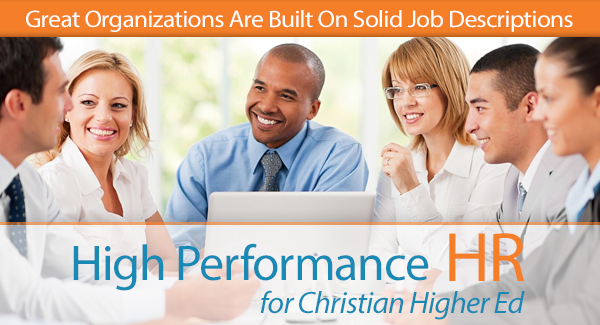 In His Name HR helps organizations build high performance Human Resources programs. Visit them at In HIS Name HR or e-mail them. 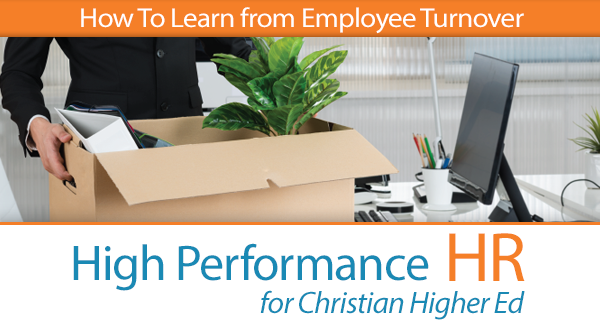 Why are people leaving your organization? My client’s eyes glazed over when I asked her this. She didn’t know why more than 13 percent of her workforce left every year – and hadn’t even thought about figuring out the reasons. In my experience, most organizations fail to document why people leave. If they do conduct exit interviews, they often don’t probe deeply enough. Or, they fail to effectively learn from their findings and implement change for the better. According to The Wall Street Journal, by the time a talented worker has decided to leave, it’s probably too late to make the necessary improvements to keep them. But, finding out why people aren’t staying with your organization is critical to your future success, especially in tough economic times. Keeping competent employees is one of the best ways to save your organization a lot of money and keep a cohesive and healthy workplace culture. The high cost of hiring and training employees warrants that you learn from what isn’t working, every time. There are several reasons why people leave. In previous articles we have discussed many. One area that continues to gain attention is organizational vision or lack thereof. Make sure your vision is properly integrated within your HR programs. Employees need to be part of it and understand where you are going. A recent article from Barnard Marr on CNBC.com cites “No Vision” as being a leading cause of turnover. I agree. Most employees want a hope and a future and a great vision that is bought in by all helps create energy in the workplace. So, appreciate the rich source of information that a good exit interview brings! What the work climate is really like? Whether and how are your managers are failing. Do your employees get what they really need to do well? If people are leaving too frequently, it’s time to find out why. When did you realize you wanted to leave? Did you and your manager set goals and objectives together? How often did you receive helpful feedback from your leadership? 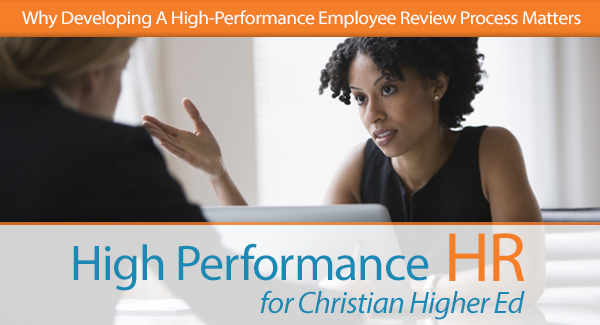 First, conduct your exit interview with a spirit of grace and graciousness. Your concern and honest inquiry into the reasons your employee is leaving will yield valuable insights if you put them at ease. This is where your core values come in. Second, remember to set up an exit interview at a time designed to give you the best information. Don’t rush in at the last minute, just before your employee’s departure, or try to get information after they’ve already moved on. Finally, wish the employee well in their new endeavor. At some point, they may want to come back. If they feel cared for during this last important experience, they will know that the door is still open. Losing a talented employee is disappointing, but it might be redeemed if they happily return in the future. Have you used exit interviewing before? Please take a few moments and tell our community of readers your experience.